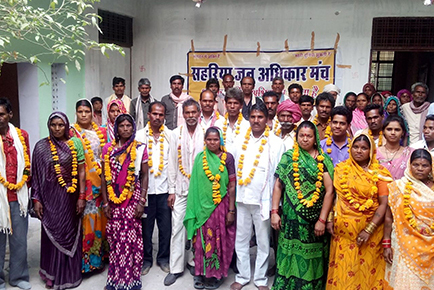 “Our community had, for long, been excluded from development processes and our socio-economic conditions continued to remain appalling,” says the 34-year-old Veeranna Sahariya (fourth from right in the picture) from Lalitpur district, Uttar Pradesh, recounting the woes that his community was having to face till some time back. However, their lives were soon to see a transformation, for the better! As part of its intervention in villages across Lalitpur, ActionAid India, along with its ally, Sai Jyoti, started facilitating the formation of village development committees, Mahila Mandals (women’s collectives), adolescents’ groups and children’s clubs. As a result, the awareness of community members on their rights and entitlements started to increase. And shortly thereafter was born Sahariya Jan Adhikar Manch, a powerful community-based organization. “Through collective advocacy, we were successful in influencing the Government of Uttar Pradesh to notify the Sahariya community as a Scheduled Tribe. With this new status, we are now able to avail related benefits. Thanks to the Manch’s efforts, our families are now able to avail education, health services and nutrition, livelihoods etc. We are thankful to Sai Jyoti and ActionAid India for their support that empowered us to realize our rights,” says a happy Veeranna. Through the support of Sai Jyoti and ActionAid India, 500 families across Lalitpur secured ownership of residential land and nearly 150 families obtained deeds for agricultural land. More than 1,000 farmers, including nearly 500 women, have been trained on sustainable and organic agricultural practices. Women are now establishing kitchen gardens and their children are now getting nutritious food. Among other key achievements, more than 5,500 children across these villages have been brought back to school and over 50 child marriages stopped.